Full press release and spec list below. 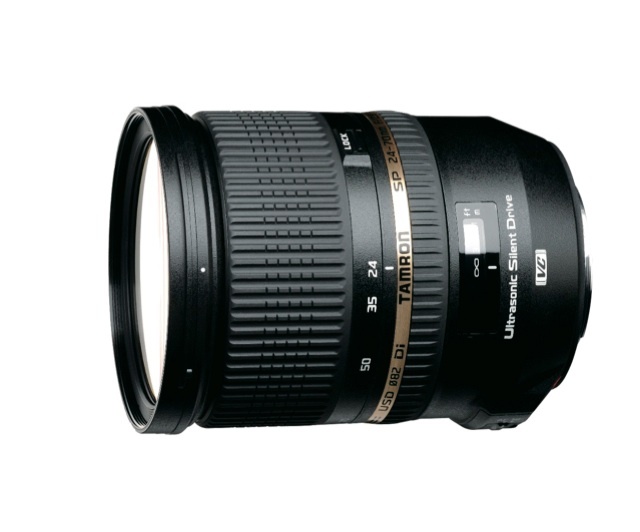 February 6, 2012, Saitama, Japan － Tamron Co., Ltd. (President & CEO: Morio Ono / Headquarters: Saitama City), a leading manufacturer of optical equipment, announced the development of the SP 24-70mm F/2.8 Di VC USD (Model A007), the world’s first1 full-size high-speed standard zoom lens equipped with VC (Vibration Compensation) image stabilization and USD (Ultrasonic Silent Drive), with resolution at the top of its class. The lens will be developed for Canon, Nikon and Sony mounts. A release date has not been announced. Product Features 1. World’s first full-size, high-speed standard zoom with built-in VC (Vibration Compensation). Even when shooting in low-light conditions with a slow shutter speed to render sharpness, Tamron’s acclaimed VC allows for stable handheld camera work, to more fully enjoy the benefits of this high-speed zoom lens. 2. Uses specialized high-grade glass in the three LD elements, three Glass Molded Aspherical Lenses, one Hybrid Aspherical Lens and two XR (Extra Refractive Index) glasses, delivering top-of-the-class quality images suited to this high-grade lens. Using a rounded diaphragm, the lens achieves gorgeous blur effects. 3. Features USD (Ultrasonic Silent Drive) to power a speedy AF drive together with a continuous manual mechanism. 5. The lens adopts the new technology including the latest optical design, VC (Vibration Compensation) image stabilization and USD (Ultrasonic Silent Drive), all in a lighter and more compact package. Great article. I have no idea how an optical image stabilizer module looks like internally, but recalling back I remember seeing exploded diagrams of gyros and a moving, de-centering lens that corrects for angular camera shake. I think it was a diagram from Canon. What I didn’t know was how Tamron designed its VC mechanism and I learned a few things about the internal moving magnet and coils. From my 2-year plus experience owning the Tamron SP AF 17-50mm f/2.8 XR Di II VC, it seemed like a rushed job by Tamron’s engineers. That lens’ VC mechanism was literally clunky and slow to engage and disengage. I later learned that the proper way to use the 17-50mm f/2.8 VC was to give it a bit of time for its VC mechanism to actuate before releasing the shutter. There’s also another design flaw with the 17-50mm f/2.8 VC: poor sharpness at the edges and especially at 50mm focal length, compared to the original non-VC version, which was cheaper. I only realized this AFTER I had purchased this lens and wished I had done more research between the two models. 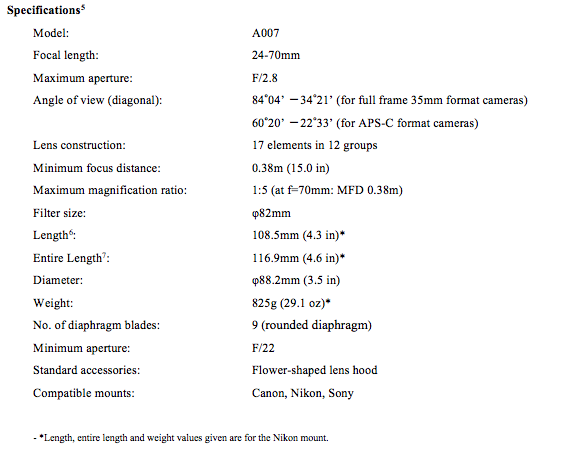 The non-VC variant as tested by The Digital Picture review site, is about as sharp as Canon’s pricier EF 17-40mm f/4L USM (if you call the 17-40mm f/4L sharp, that is). I hope this lens will be optically better than the original 24-75mm f/2.8 XR, because I’ve noted several folks on Flickr who had been inquiring about the 17-50mm f/2.8 VC opted for the non-VC model, which is sharper and cheaper albeit without image stabilization. Canon’s EF 70-200mm f/4L USM is a sharp lens to begin with, and its IS model turned out to be even sharper. With Tamron’s 17-50mm f/2.8 models, it was quite the reverse. If Tamron really wants to win fans with this new 24-75mm f/2.8 VC USD, it better be a true improvement over its predecessor. What happened to the “PZD” moniker? Is the new “USD” designation merely a change in acronym or is the USD is the better version of the PZD autofocus drive?